Porcelain veneers can change the shape, color, length, or width of your teeth. Veneers are a thin, semi-translucent laminate permanently bonded to your teeth. While they are not suitable for every patient, veneers are the most aesthetic alternative for a variety of dental conditions involving the front teeth, including diastemas (spaces between teeth), broken or chipped teeth, unsightly, stained, or washed-out fillings, permanently stained or discolored teeth that can't be bleached, or crooked teeth. 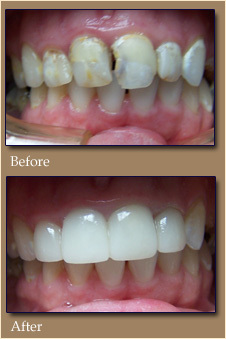 One of the great advantages of veneers is that the procedure usually takes only two visits. Veneers can last indefinitely, depending on how well they are taken care of. They are also more resistant to stains and chipping than regular bonding.